Drew Holcomb may not have the marquee name that brings the kind of anticipation that fame and renown guarantees. What he does possess is an undeniable ardor and passion. And the knack for melodies that immediately get under the skin. That’s never been more evident that on Souvenir, an album that could very well bring the man the commercial breakthrough he deserves. Coming quickly on the heels of Holcomb and the Neighbors’ recent concert set Live at the Ryman, and before that, a string of fine studio albums, Souvenir is, in a word, a triumph, and, with the exception of the pleasantly jaunty “Mama’s Sunshine, Daddy’s Rain,” every song contains could be deemed an anthem. Each makes such an impression that it’s practically impossible to tout one above the rest. Still, it wouldn’t be doing Holcomb justice to leave it at that. The remarkable wallop of “The Morning Song,” “California,” “Fight For Love” and “New Year” allows each track to resonate deeply. It’s a physical kick, one that inspires a pumped fist and a surge of adrenalin. These are the kind of songs that that would in stadium settings, and even the most aching ballad reverberates in such a way that allows the emotions to shine through. 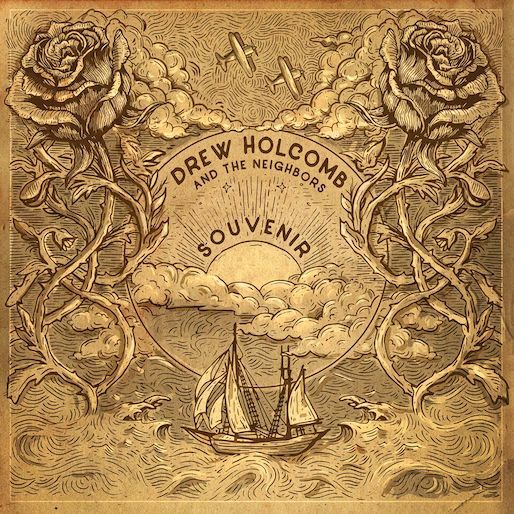 Drew Holcomb and the Neighbors are one of those quintessential combos that take their inspiration from the heartland and turn into music for the rest of the country, if not the world. It’s early yet, but this one already feels like a lock for the Best of 2017. No matter what the rest of the year has in store, this will be one Souvenir worth treasuring.